Another part of the ‘Unexplored Riches in Medical History’ project is to catalogue children’s case files. A case file was created for every child that came into the care of The Children’s Society. These case files were used by The Children’s Society’s head office to store all their forms and correspondence relating to that child; this makes the files a great resource for researching the lives of individual children, the reasons why they came into care, what their lives were like while being looked after by The Children’s Society, and where they went onto afterwards. 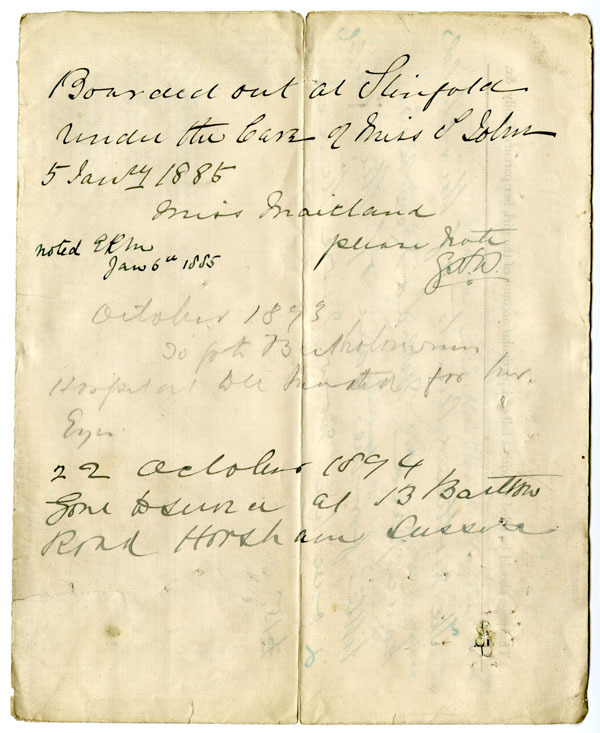 1850 case files have already been catalogued as part of a previous project. Now, the ‘Unexplored Riches in Medical History’ project aims to catalogue even more case files and so make them searchable and usable. In terms of medical history, the case files contain a great deal of information. Application forms found within the files tend to detail the health of the child and their family as well as giving information about the child’s living conditions and family circumstances. If the child became ill while in The Children’s Society’s care, this is often documented in the correspondence found within the case files, especially if the child was sent to hospital or to a convalescent home. The above image comes from the application form for case file 419. On the back of each application form, the child’s case history is noted, stating where the child was placed. 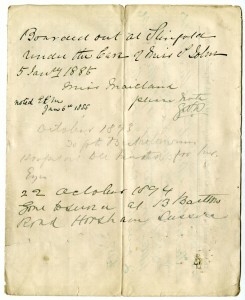 In this image, it says that in 1893 the child entered St Bartholomew’s Hospital. Within case file 419 there is further correspondence regarding the child’s visit to hospital. This is just one example. There are many other case files that can be used to study the history of diseases and treatments. Because of this, it is the aim of the project to catalogue and index more of our case files. The indexing in particular will make it easier to search the case files for specific topics. One part of the ‘Unexplored Riches in Medical History’ project is to catalogue the records of The Children’s Society’s children’s homes. In 1882, The Children’s Society (then known as the Waifs and Strays Society) opened its first two homes; a home for girls in Dulwich, London, and a home for boys in Clapton, London. From that point onwards, the number of children’s homes continued to grow until The Children’s Society was running a whole network of children’s homes in England and Wales. The Children’s Society continued to operate children’s homes until the late-20th century, at which point it evolved away from residential child care to start working with children and young people in new and more innovative ways. Now that The Children’s Society’s homes have closed down, their memory survives in the documents and records that they left behind. These records were created during the day-to-day work of the homes and so can shed light on all aspects of the way the homes were run, from anything as varied as the layout of the buildings to what the children ate each day. Amongst the records of the children’s homes are many items that can be used to study medical history and childhood diseases. 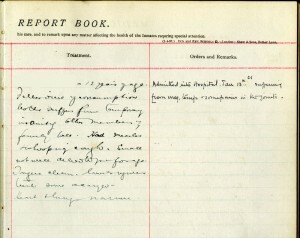 For example, the image below shows a page, written c1896-1901, from the medical register kept at St Oswald’s Home For Girls, Cullercoats, Whitley Bay, Newcastle upon Tyne, Northumberland. [The child] – 12 years of age. not well developed for age. from irreg. temp & some pains in the joints. 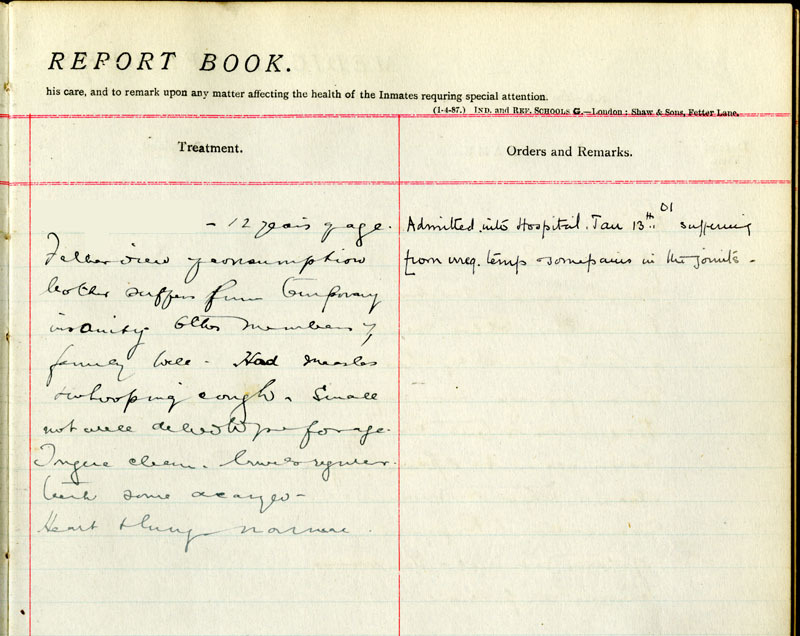 One of the aims of the ‘Unexplored Riches in Medical History’ project is to catalogue the records from The Children’s Society’s children’s homes, including medical records like the one above. The catalogue will list exactly what records we have for each home, which will make it much easier to use the collection to research medical history as well as a large number of other topics.